Audiophiles are interesting in that many of them tend to eschew simplicity in favor of complexity, as demonstrated by the sheer number of separate boxes some use to handle each function of a system. The reason for doing so is obvious: an outboard DAC, dedicated CD transport, outboard phono stage, separate pre- and power amplifiers, and tuner (not to mention the various cables necessary to hook them all up) allow the listener to tweak the sound of a system at any point in the chain. Admittedly, in this regard, my own system is very non-"audiophile." For my reference integrated amplifier, I use a Bryston B100SST that features both an onboard DAC and MM phono stage. That leaves only the speakers, turntable, and something to spin CDs on to affect the sound of my stereo. I prefer to keep things simple. For this reason, I was pretty curious when the assignment came to review TEACs Reference AG-H300mkIII stereo receiver ($349 USD). This little box, only half the width of most standard components, costs roughly one-twentieth the price of my reference integrated, yet manages to handle all the same functions (except that it has an AM/FM tuner but no DAC). Even I, who values simplicity and a more integrated design approach, was surprised by what such a small box at such a bargain-basement price is claimed to do. I wanted to know what the tradeoffs were. The AG-H300mkIII is claimed to deliver 35Wpc into impedances of 8 to 16 ohms; TEAC recommends that it not be used with speakers rated at less than 8 ohms. This gave me pause -- my own speakers, the PSB Platinum M2s, are rated at 4 ohms. Still, the SoundStage! Networks measurements of the PSB Platinum M2 show that it doesnt really dip below 5 ohms, and instead hovers, for the most part, at or above 8 ohms. My listening bore out that this wasnt really a problem for the AG-H300mkIII, which commendably drove the M2s. The AG-H300mkIII measures 8 7/16"W x 4 5/16"H x 12 1/16"D and weighs just under 9 pounds. It comes with a remote that controls all of the receivers functions, and also operates TEACs PD-H300mkIII CD player (review forthcoming) and R-H300mkIII tape deck. The remote has a dimmer button for adjusting the brightness of the display, and a sleep timer for those who enjoy dozing off to music but would like the receiver to shut itself off after a predetermined length of time. Around back are five inputs, including CD, phono, tape, CD-R/MD, and auxiliary, as well as two outputs for recording with the tape or CD-R/MD functions. An AM loop antenna and an FM antenna (both included) also plug in at the back. In addition, there is a reset switch should the receiver be shut down by a power surge. The lone pair of speaker posts can accept bare wire or banana plugs. At opposite ends of the faceplate are two large knobs: one for selecting the source, the other for adjusting the volume. There is also a dial for channel balance, and tone controls for ±10dB bass and treble adjustment. In addition to the five dials and a headphone input are buttons for Power and Standby, FM Mode (mono or stereo), Tuning/Preset controls, Tuning Mode (Manual or Preset), Band (AM or FM), and Memory (to program radio-station presets). The combination of the small faceplate and large display, which also indicates which input has been selected, means that the front of the AG-H300mkIII is busy, to say the least. The TEAC wont win any beauty contests, but its small size and overall symmetry help make it pleasing to the eye. Furthermore, its large display can be easily read from across the room. Holding the AG-H300mkIII in my hands, I was impressed with its relative solidity, due in part to its thick front panel of brushed aluminum. And I was surprised by how many features you get for $349. I couldnt help thinking that the AG-H300mkIII might be ideal for someone buying his or her first component system, or someone assembling a smaller second system for the office or bedroom. I connected the TEAC AG-H300mkIII to my PSB Platinum M2 bookshelf speakers using AudioQuest Type 4 speaker cables terminated with banana plugs, and linked my NAD C542 CD player to the TEACs CD input via Kimber Kable Tonik interconnects. Finally, using AMX RCA interconnects, I hooked up a Thorens TD-160HD turntable, fitted with a Dynavector 10x5 high-output moving-coil cartridge mounted in the Thorens-modified Rega RB250 tonearm, to the TEACs phono section. I had some reservations about using the PSB Platinum M2s, but little reason to worry. When listening to CDs, I rarely turned the volume dial up by more than 25% to play as loudly as I could tolerate (with LPs, the volume ended up closer to 50%). At higher volumes, the PSBs started sounding hard and the bass became really loose, but I never drove the TEAC into clipping, and I suspect I had some headroom to spare. The little AG-H300mkIII was more powerful than its size and price indicate. And a good thing, too -- lately Ive been listening to more hip-hop, a genre I tend to play relatively loud. Here the AG-H300mkIII demonstrated good pace and rhythm, making A Tribe Called Quests The Love Movement (CD, Jive 01241-41638-2) a great toe-tapping, head-nodding experience. When I switched over to vinyl, the TEAC had me fixated squarely on the music as I played Madlibs beats and MC Dooms lyrics from their 2004 collaboration, Mad Villain (LP, Stones Throw STH2065). The AG-H300mkIII produced "fat"-sounding bass from both albums, something very conducive to the re-creation of the sound of hip-hop. The bass wasnt the best-defined Ive heard, but it was full in a way that easily filled my room with enough low-end energy to bring about the sort of visceral experience that is so integral to this music. The AG-H300mkIIIs ability to render big acoustic spaces was another of its strengths. I noticed this when listening to several CDs, among them Eddie Vedders soundtrack to the film Into the Wild (CD, J Records 88697-15944-2). On "Society," Vedders vocals were more forward-sounding than I ever remember hearing them, but the reverb added to the mix gives the impression that the song was recorded in a large hall rather than in a studio in Seattle, and works to good effect. Through the AG-H300, Vedders lyrics were presented clearly, as they traveled to and bounced back from the distant walls that seemed to surround him. The TEACs notable re-creation of ambience was also well suited to Radioheads Kid A (Parlophone 5 27753 2). I find that this disc creates a more expansive soundscape than any of the bands other albums, and the TEAC did a good job of helping me follow what was happening in the music while deeply immersing me in Kid As enveloping sound. Ditto for Great Lake Swimmers wonderful Ongiara (CD, Nettwerk 0 6700-30691-2), recorded in Aeolian Hall in London, Ontario, Canada. The AG-H300mkIII convincingly conveyed the openness and spaciousness of the Aeolian, helping to bring a certain intimacy to the music. Despite its adequate power and fine re-creation of recorded space, one of the TEACs shortcomings was its lack of transparency and detail, particularly in the lower midrange and bass. In practical terms, this meant that I couldnt hear as far down into recordings. As a result, some information, such as the trailing edges of notes, was obscured by the AG-H300mkIIIs own noise floor. Sounds tended to blend together, and distinction gave way to homogeneity. A good example of this was Elliot Smiths "Going Nowhere," from New Moon (CD, Kill Rock Stars KRS455), in which Smiths warm voice was easily discernible through the TEAC even as it blended together chords played on the acoustic and bass guitars and made them difficult to separate. Listening to Wilhelm Kempffs recording of Beethovens Piano Sonata No.14 (CD, Eloquence 469 618-2), it wasnt the poor decay of the notes that I noticed so much as the fact that the pianos higher registers tended toward brightness. This made the instrument sound more forward, and the aggressive tone ended up detracting from the serenity of this beautiful work. Obviously, one cant expect the world from a $349 receiver. As mentioned earlier, the TEACs bass sounded very full -- if you like thick, fat bass, the AG-H300mkIII shouldnt let you down. The lack of trouble it had in filling my listening room with plenty of low-end energy probably helped to make this receivers sound seem bigger than it actually was. Unfortunately, I didnt find that the TEAC always had a firm grip on the PSB M2s 6.5" midrange/woofers. In fact, those drivers sounded woollier than Id ever heard them, though their slightly-lower-than-recommended impedance might have been a factor in this case. More than likely, for the power amplifier section, youd be wise to heed TEACs recommendation and stick to speakers with impedances of 8 ohms or higher. The AG-H300mkIIIs tuner section worked well, particularly the FM band, which was able to lock on to the strongest stations and bring their signals into my listening room with excellent clarity. I was able to appreciate the TEACs large display most when using the tuner, because it was so easy to read from across the room. I wish the remote had allowed me to navigate across the entire FM band rather than just skipping between a few preset stations -- or had a scan function that served the same purpose but locked on to only those stations with the strongest signals. AM reception wasnt nearly as clear as FM; far fewer stations came through properly. However, people who live in more remote locations, or concrete buildings in which the indoor strength of the signal is compromised, can use the AG-H300mkIII with an AM outdoor antenna (not supplied). Although the tuners performance was mixed overall, its inclusion is a welcome addition to this feature-rich, inexpensive receiver. The greatest asset of the TEAC ReferenceAG-H300mkIII is that its a remarkably functional stereo receiver. I was also thrilled when I realized it had a phono section -- given the recent resurgence of vinyl, the inclusion of a phono stage isnt insignificant, and lately Ive been spending more time listening to LPs than to CDs. But the phono section can be thought of as icing on an already rich cake. The AG-H300mkIII is the proverbial Swiss Army knife of audio gear. It packs just about every function you would want or need into a discreet little box with an absolute minimum of hassle. For most systems, Im at a loss to think of much that the AG-H300mkIII cant handle. For its $349 asking price, it offers a lot of features. In terms of sound quality, it has strengths. I found it more powerful than its size and price indicate; it surprised me by driving my PSB Platinum M2s to high enough volumes without running out of steam. It also had an uncanny ability to sound big -- the bass was full and rich, and it did a good job of re-creating space. However, there were some weaknesses. Transparency and detail were only so-so, and, when push came to shove, the AG-H300mkIII couldnt control my PSB M2s woofers as well as more robust amplifiers can. I began this review by saying that audiophiles often favor a separate, dedicated component for each function of an audio system. In that sense, the AG-H300mkIII isnt an "audiophile" product; however, I dont think thats what this receiver is all about. Clearly, the AG-H300mkIII was designed to be a good buy for someone who wants good sound at a low price and requires a good number of features -- that first-time stereo buyer, or someone who wants to set up a small second system in a bedroom or office. 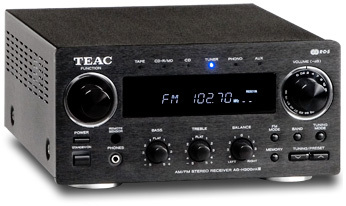 For those folks, the TEAC Reference AG-H300mkIII delivers a lot for a low price.